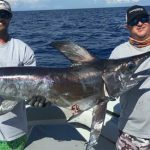 Swordfishing in the Florida Keys is absolutely amazing! Battling these true warriors of the open ocean is something that you will never forget! 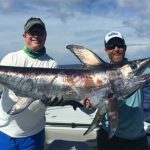 They are absolutely the perfect gamefish, and even the smaller ones can take an experienced angler for the ride of their life! While the majority of this fishing is done at night, it is truly a site to see the ocean lit up from the Hydro Glow’s (fish attracting lights) and the balloons on the surface, as we drift over ledges and sea mounts waiting for the drags to start screaming! 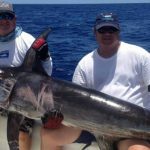 I guarantee you it is unlike anything you have ever experienced, and is definitely something that all fisherman or fisherwomen should experience at least once! This is full contact fishing! You are in a full harness, locked to the rod in the stand up position! No chairs here! 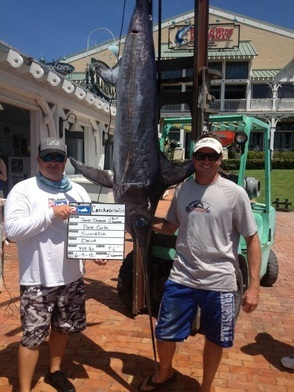 This is man against the “Prince of Darkness” (Swordfish’s Nickname) in a stand-up, true fishing battle! These fish can take you deep or stay on top, and the second you get cocky, they will show you why the are nicknamed the “Prince of Darkness”. They will Sound on you so fast that you will pray to get line back on the reel! It is an amazing sight to see! 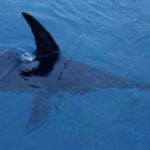 We are very lucky here in Islamorada to have this fantastic fishery, as we are actually a nursery for these magnificent animals, and they are here all year long! Although, we generally don’t fish for these guys during the winter due to a little choppier weather, but when the winds stop it is possible if the timing is right! If you don’t want to fish at night, these guys can also be caught during the day! 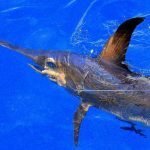 It is performed quite differently from nighttime fishing, but has proven to be quite productive! 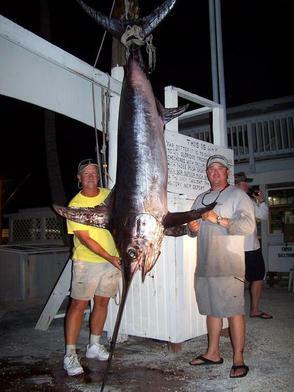 So come on down, and check out what Islamorada Swordfishing has to offer! It is absolutely Amazing!